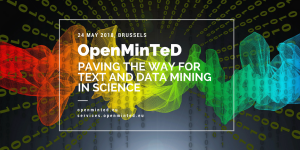 The event ‘OpenMinTeD: Paving the way for text and data mining in science’ marks the official launch of the OpenMinTeD platform (www.openminted.eu, services.openminted.eu). We would like to invite you to join us for a live discussion on the way forward. To join the event, a registration via Eventbrite is required here. Why it matters: We live in an era of exponential growth of information in the scientific digital world. To make sense of all this information encoded inside text and data and unlock the potential of turning information into knowledge, text and Data Mining (TDM) has emerged as powerful and valuable assistant. What is it about: It is about unleashing the power of open access and open science. 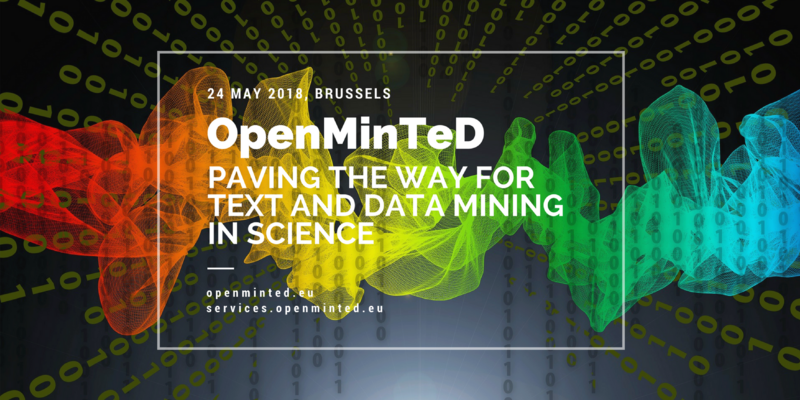 OpenMinTeD (a H2020 project) has paved the way for TDM in science by establishing a cloud-based TDM infrastructure for scientific literature. It has brought together publishers and repositories, TDM software providers, domain discipline researchers and the industrial world through the use of a collaborative platform that allows sharing and re-using of content, TDM services and cloud resources. Who is it for? Whether you are a publisher or repository manager, a TDM software provider or developer, researcher, SME, company, funder or government employee, feel free to join and participate in this open discussion. The event’s agenda covers a broad spectrum of topics that build on a story around TDM. The event will start with a short introduction of what OpenMinTeD is and then continue with a session on the perspective of TDM for EU. A storyline on TDM follows; our story will include a demonstration of OpenMinTeD on how you can process, share and discover TDM tools and content. Following is a session on content providers that will be completed with an open discussion and a practical presentation of TDM tools. Few of the questions that may arise are; why is TDM important for a publisher? what is the value added by TDM on publishers business and the impact of TDM? why should a publisher care and adopt TDM? what about policies? This session demonstrates the applications/components created and integrated in OpenMinTeD by our Tender call winners and use cases partners. To TDM or not to TDM? A ‘theatrical’ setup follows by legal experts on Open Science and TDM with a moderator that will set a creative dialogue. The legal experts explain the ‘drama’ and ‘catharsis’; “to TDM or not to TDM?” This open discussion session focus on TDM, the barriers, the challenges, how OpenMinTeD managed to overcome legal issues, how OpenMinTeD informed researchers, TDM experts, content providers. 13:30 – 14:30 A discussion with legal experts. Last but not least, the 3YFN panel discussion will focus on SMEs, industry and potential future use of TDM technologies, platforms, infrastructures. How industry responds and moves towards the TDM adoption. Few of the topics under discussion are; What is the role of the different industries and startups in this process? Everyone is talking about TDM today; what makes it so important after all, and why is it difficult? What can be the role of the infrastructures? Will GDPR signal the death of TDM?